As the title indicates, life is pretty busy and I can't believe how quickly time is going by. It feels like I'll never get everything done! On Thanksgiving morning Jon participated in his first 5K!! He wanted to finish in less than 50 minutes and came in with a time of 49:47. This time was accomplished even with stopping to pick up Gus so that they could cross the finish line together. I'm so proud of Jon. For Thanksgiving dinner we went to my sister's house. As expected, Gus had a great time seeing his cousin who is a freshman in college this year. Friday afternoon we all headed out to do some Christmas shopping. Now it's just a matter of getting everything wrapped. This is not something that I can do when Gus is awake because most of the wrapping that needs to be done are gifts for him. Saturday we put up the Christmas tree, hung our stockings and decorated the mantle. It was so bittersweet to see how much fun Gus was having helping us out. I had hoped to find Gus an advent calendar for December. The only ones I could find were ones filled with candy each day, so I ended up not getting one for him. 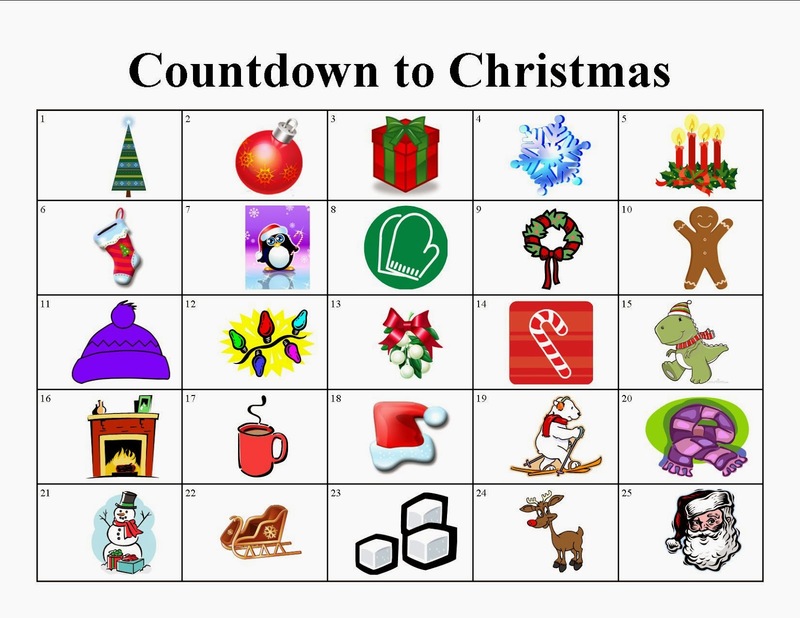 After seeing how happy he was to begin decorating for Christmas, I decided to make him a Countdown to Christmas calendar. Each night before bed we cross off that day's picture, and the next morning we talk about the picture of the day. I'm so glad he likes it. On Monday we received the preliminary results of Jon's SA, and things are looking better, even without meds (42 million total motile sperm and 45% motility). After discussing everything, we are moving forward with the following plan: Jon will continue on the medication through February. He has scheduled his follow-up SA for February 10 and a follow-up appt with Dr. W on February 24. Our hope is that by being on the medication we can take his sperm from good (most recent SA) to great! I will stay off BCP indefinitely. I spoke with my RE today and questioned if there were any ill effects from staying off BCP since I don't cycle on my own. He advised that there is nothing detrimental about staying off BCP (and not shedding my lining) for a few months. With that, we will continue to try for a miracle through February. Yesterday was the first HPT during our miracle month. As expected, it was negative. Our next test is 12/14. Gus is the Star of the Week in his classroom this week at preschool. We were to help him fill out a questionnaire (birthday, favorite color, favorite book, pets, family members, what he wants to be when he grows up) and send any pictures we wanted to be displayed on the Star of the Week bulletin board. He was so proud and excited to bring in the questionnaire and pictures yesterday and show them off to his teachers. I just love him so much! I've been working on our Christmas letter, but the pictures are taking me much longer than usual, which is not a good thing. In past years, i would just go through the pictures we'd taken on our camera and insert those into the letter. Now that Jon and I both have cell phones, I not only need to go through the actual camera, but also the new camera (ours broke in mid-August and we replaced in in October), plus the pictures taken with each of our cell phones. To date, I've already gone through the "old" camera and am through September on the images from my cell phone, but that still leaves the "new" camera and Jon's phone. Our house is a pigsty right now, and I blame the holidays. We should have spent time cleaning over Thanksgiving weekend, but we filled that with holiday stuff (5K, family time, Christmas shopping, Christmas decorating). So, every day is a battle of trying to get something accomplished after Gus goes to bed. Jon and I have created an exercise schedule. I'm hoping that this will help me stay on track with exercise, as well as be mentally prepared for when I know that Jon will be unavailable to help with dinner/bedtime so that Jon can feel better supported by me in his exercise and health efforts. I'm anticipating that Christmas will be really hard for me this year. Christmas is always hard because of not having Oscar, Bella and Tittle here, but this year I should be almost 31 weeks pregnant with Firefly. Do you do Pinterest at all? There are a TON of advent calendar ideas--you can make them with mittens and stuff them with little boy stuff...of course its a bit late, but maybe next year! Glad your hubby's results got better! Hopefully February brings you your miracle!!! I don't Pinterest, but I bet there are a ton of ideas on there. I remember as a kid getting an advent calendar from my grandparents, and it was simple: open the flap each day and look a the hidden picture. There were no gifts associated with each day, and it truly was a countdown to Christmas. Maybe I'll look for something more substantial for next year, rather than a piece of paper. My immediate thought right now is to make a fabric Christmas tree and the counter is an ornament. Not sure if he should count towards the start on the top of the tree or the presents at the bottom!